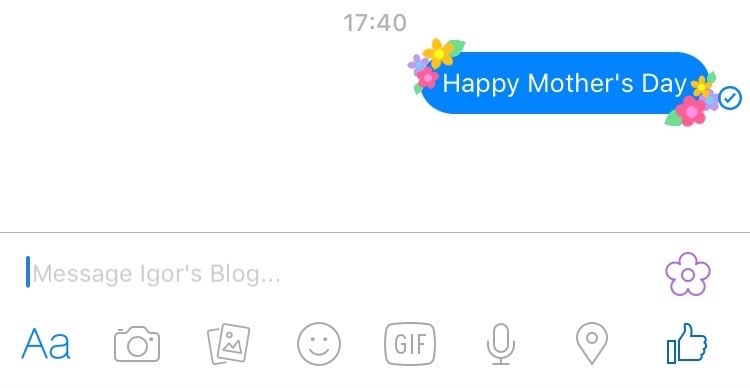 The Facebook Messenger App has been updated in time for Mother's Day to allow you to decorate a message with flowers. By tapping the flower just above the 'Send' button will notify you that 'Your message will be decorated with flowers' and the resulting message will have a bunch of animated flowers around it. This doesn't work for the Pages App messages and also doesn't work in apps like Goofy. Oddly enough the Facebook website and it's Messenger site also do not have this feature. It looks to be available only in the Messenger App on mobile devices. So if you haven't updated your Messenger App yet go to the App Store and download the latest version!